Yesterday I visited a friend's house up in the Traverse City (Michigan) area. They live perched on a high hill above a tract of almost impenetrable forest. There are bears, wolves, and lately cougar tracks around their house, so trust me, this is a wild place. I have written once before about the natural spring that sits below their house on the edge of the forest. 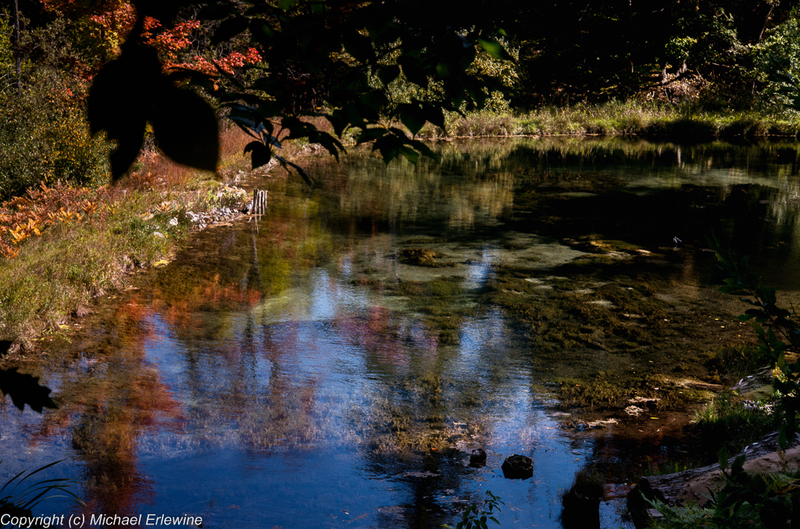 The pure springs that feed this pool have been there for…. well, relatively probably forever. Unlike most woodland ponds, which tend to be muddy, this spring is crystal clear and fresh all the time. In winter it never freezes and animals come to drink there. Today, as I gazed on it, fish swam lazily in its waters, and I am told that Native American tribes from all over the country used to converge in this particular area. When I first saw this spring (about a year ago) I knew that in some way it was a sacred place, certainly a special pool. Recently my good friend Lama Karma visited the spring and blessed it. He reported, as I surmised, that this indeed was a place where the Sadak (Sah-Dahk) gathered, the local protector deities, in particular, so he pointed out, the nagas, snakelike spirits that gather in waterways, pools, and underground streams and serve as protectors of the water and the land. This lovely spring is worthy of their protection. I didn't have my tripod, but I took this photo and then circumambulated the spring that bubbles up from the ground. I only got a little wet when I had a misstep on some moss than sank under my weight. And I saw a little altar that has been set up on a wide stump, where Lama Karma had left a very sacred article, a tiny piece of shell that had been like a bearing in his own mother's prayer wheel. As the prayer wheel turns, it sends out thousands of mantras, and very, very gradually wears down this abalone or shell-like bead until it is but a tiny wafer with a hole in the middle. Lama Karma had only two of these precious beads and he wore them around his neck. When he was here, he took one off and placed it by the spring as an offering. Later, after I climbed up the steep hill away from the spring and to the house where we were visiting, a huge updraft of warm air swept upward in front of me, carrying hundreds of single oval leaves (lanceolate is the term) and suspended them against the sun high above me, where they turned like little spinning tops in the air. They stayed there for many minutes, looking for all the world like a myriad of butterflies fluttering high above me in the sunshine. Perhaps this was just the nagas saying hello.